This is a result of a FOIA request on inspections at the Mexico border pens. We are all sickened by the lack of inspections, enforcement and what American horses endure in the slaughter pipeline. A total of only 199 inspections took place during 2010, 2011 & 2012. Our thanks to our investigators for their diligence and determination in exposing the inexcusable conditions and treatment of American horses. We wish the horse owners could see what road they have chosen for their horses. The photo of the mare and her foal is heartbreaking. We encourage everyone to call their legislators and demand passage of the S.A.F.E act to end this now. I am sorry, readers. This should be “Feel Good Sunday” but we are in the middle of a battle where we cannot afford to take a day off. It is time for action so please abuse a few moments of your Sunday and review the documentation and then nail your legislators. Enough is enough…it is time for an end to this abuse. In wholehearted agreement! We cannot holder stop the war just to kick back and relax. In order to win it, we got to hit it hard and mostly get those bills fast tracked through Congress and keep the pro slaughter congressmen and womens hands out of it. We know that we have to fight dirty as they do because were up against three criminal minded. We can’t afford to slack off..
Actually, this is Feel Good Sunday! When I looked at the graph on Popvox and saw support was over 80%, it made me feel good! Thus-Feel Good Sunday!!! I understand that the bill is in committee as of the 12th, but many bills NEVER get out of committee. 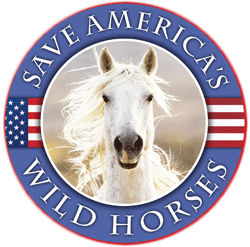 Do you think this is more lip-service by the government to keep horse advocates at bay while deals are being made behind closed doors for the roundups to begin in Wyoming???? I had hoped that the U.S was better than Europe in this respect. Horses over here have the same horrendous treatment during their long journeys from Poland (made extra long to avoid passing controls in Austria where they check everything) through 4 different countries before reaching France and Italy for slaughter. I fail to understand why animals destined for the dinner plate (I am vegetarian BTW) cannot be a carcass only trade WORLDWIDE. These journeys (for all animals) are considered the world’s greatest single abuse of animals. It makes me sick. Cannot watch the video. The lack of respect for our magnificent horses.. period..makes one want to cry. and be very angry. What does it take to cease these injustices!!! Tomorrow will be my day, to contact my legislators, re: these concerns. Thanks, again, R.T.! R.T., you are so right. We can’t take any time off. BTW according to Animals Angels KY has 20 kill auctions. Some people think slaughter stops horses from starving but animal abuse will only be stopped by laws that are strong and enforced. I just emailed Vicki after I perused the USDA daily reports and found many are duplicates. I don’t know if this is a problem with the scanner or if they are trying to pad their numbers hoping nobody will notice. March 28, 2012 shows 4 horses dead, 1 nearly dead and a 6th dead in the pen. This report I found 4 times scattered throughout the documents. I noticed quite a number of others as well. You’re right R.T. … strike while the iron is hot. We can’t let up on the pressure to Congress until the animals are S.A.F.E..
Steve, I emailed Vicki also – there were more than just duplicates – there were many of these so-called reports that had 4 & 5 copies of them. I also saw so many that said “no injuries etc” – how can these supposed inspectors live with themselves. The foal & others “taken to a landfill” & put down????????????? Yes, we noted that in our summary. The investigators went through the FOIA and counted 199 load inspections out of a possible 6,621 loads (based on 35 horses per load) over 3 years. It was a real eye opener. The USDA is asleep at the wheel and now, by law, they have to issue inspection permits for a non-food animal that will compromise our food safety. We have to either get he defunding language back in the 2013 senate approps bill or ram the federal legislation through NOW. Reblogged this on Serenity's Musings. The USDA Response is 373 pages long, and there’s no way most legislative aides are going to wade through it. If they do, they probably won’t understand what they’re reading. Heck, I’m guilty on both counts! I hope someone who has credibility with the government is going to answer the questions posed in the FOIA request with citations to the various applicable pages. That way we can get a document to our legislators they can cross-reference with the download … and may actually consider. It would seem that perhaps we should bring legal action against USDA for failure to do their job, just as Valley Meats has done for failure to issue them a permit. I know that I would certainly “chip-in”. This is absolutely disgraceful of our government. Legal action is warranted if there is an attorney willing to take. The case. Many of us from all over the country would help with financing. Thank you for the information. I’ve e-mailed a basic letter for my reps and have included the USDA. Thank you everyone for analyzing the data. (https://www.popvox.com/bills/search?q=slaughter) Take easy action here! Click on both bills to show your support. Right now, support is around 80%!! Loved the “load” that showed up with no paperwork and the inspector was told the paperwork was on the second truck. Inspector noted it was not 6 pm and second truck never showed-what a surprise. I suppose the first “load” was allowed to go through to Mexico. Noted no one tracked the reject pen horses. And the “load” that had the paperwork in the trailer for 57 horses but there was on 30+ on the trailer. 199 inspections in 3 years time–its much worse than I thought. Reblogged this on The PPJ Gazette. Most are duplicates. So many seemed to be unfinished to this naive eye. Also, some do not even have the correct spelling of the transporting company, AND boy oh boy does Belgium still have their hands in the slaughter pipeline pie here in the US. This arms me with more facts when I comment in EU stories! Thanks, you all rock!!! No doubt things are the same at the Canadian border. World and make the demands that they make on our country. The very sad thing about this is that we have low life people who will anything for the almighty dollar. Total scum bags…We all need to take our country back and tell them to leave. This is Horrific…. Why is not the US conducting and managing this Slaughter of Iur Beautiful Horses????! That’s as good as it gets with horse slaughter. It doesn’t matter where it happens it’s the same hell holes and horrific transport. The pros complain about Mexico but they have the same regs as the US did and Canada does. The transport within US borders is horrific as are the feedlots and is the same as when the plants were open. They don’t care and never will. They’ve had dozens of years to make changes but nothing has changed. It was stopped and has yet to restart. It ain’t over yet! This is such a heartbreak seeing all theses horses being like this.I want to write to the legislators and put a stop to it all.